One of the easiest yet impressive desserts you can make make is an ice cream pie. In its quickest form, you buy a cookie crumb pie crust, a quart of ice cream and a jar of dessert sauce. 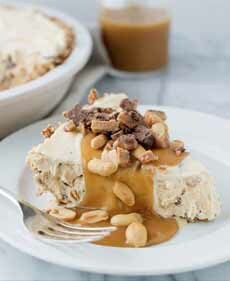 Press the softened ice cream into the crust, freeze, garnish and serve. Have a few extra minutes? Make your own cookie crumb crust and sauce, and create two different layers of ice cream, with a nifty filling in-between. It’s a make-ahead dessert that you can keep in the freezer, waiting for an impromptu occasion. What’s your fantasy ice cream pie? Crust: Chocolate wafers, chocolate chip cookies, peanut butter cookies, oatmeal cookies, Oreos, shortbread. Ice cream: Pick your flavor(s). You can also combine an ice cream and a sorbet (e.g., Creamsicle pie). Mango or raspberry sorbet are exquisite, combined with vanilla ice cream. Liqueur: Blend in 3 tablespoons per quart of ice cream, 1 tablespoon per 1.5 cups of sauce. Sauce: Butterscotch*, caramel*, chocolate, fruit purée, liqueur†. Mix-ins: M&Ms, toffee bits, flavored chips, mix whole or halved berries, diced fresh fruit, etc. Fillings: If you don’t mix anything into the ice cream itself, you can use candies or fruits as a layer, either between two different flavors or in the middle of a single flavor. Garnish: Chocolate shavings, fruit, candy pieces, etc. You can spend the summer working on recipes (one per weekend, perhaps?) and show off the “winners” over Labor Day Weekend. *Butterscotch and caramel are similar, with a key difference: Butterscotch is made with brown sugar, caramel is made with white granulated sugar. To create a sauce, the sugar is melted over high heat and blended with butter and cream. †You can add liqueur to the sauce; or if there’s no sauce, sprinkle it over the top of the pie. We add it to the softened ice cream as well. This pie uses store-bought ice cream, but you make the crust and topping from scratch. Prep time is 20 minutes, cook time is 20 minutes. 1. PREHEAT the oven to 350°F. In large bowl, combine pretzels, butter and sugar. Press mixture into bottom and up sides of 9-inch pie plate. Bake 10 minutes. Let cool completely. Peanut butter ice cream on a brownie base. Here’s the recipe from Go Bold With Butter. 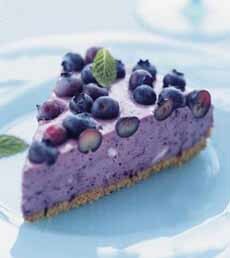 Homemade blueberry ice cream pie. You can also blend puréed blueberries into store-bought anilla ice cream (photo courtesy Elegant Affairs Caterers). 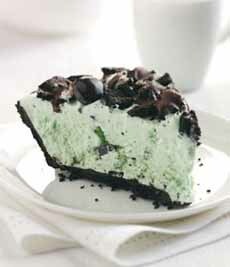 Grasshopper pie: the mint ice cream tastes even better with a few tablespoons of creme de menthe liqueur. Here’s the recipe from Taste Of Home. 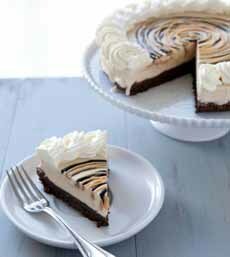 Sweet and salty ice cream pie from Go Bold With Butter. The recipe is at left. 2. REMOVE the ice cream from the freezer and let it soften for 5 minutes. Place the ice cream in the bowl of an electric mixer and mix until smooth. Add the crushed toffee bars and peanuts, mixing to combine. 3. POUR the mixture into the cooled crust. Cover and freeze until completely firm. 4. MAKE the caramel sauce: Combine the brown sugar, butter, heavy cream and salt in medium saucepan. Bring to boil and boil 5 to 7 minutes, or until sauce begins to thicken. Remove from heat and add the vanilla. Let cool. 5. SERVE the pie with the caramel sauce. Garnish with extra toffee pieces and peanuts.